Review: How much fun was this book? Tons! 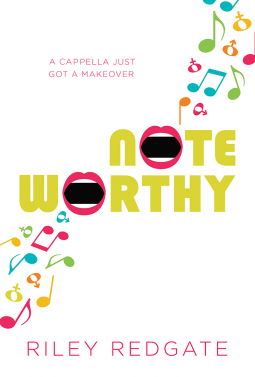 I loved the premise behind this book before it was even published, the idea of combining an A Capella group with a bit of hidden and mistaken identify sounded like so much fun and it really was just that. I'm trying to think of another way to put it so I don't continue to use fun over and over again. It was entertaining, it was thought-provoking, it was real, it was just an excellent read. Not just for the YA audience but for anyone. Let's start with Jordan. I loved her as a character because she was so determined. She is at this posh school for the arts and she knows it is a privilege for her to be there, unlike some of her fellow pupils, and so she is willing to do what it takes to make a success of herself and make her family's hardship worth it. I mean whatever it takes. I loved the fact that she builds relationships with people quickly and gets on with most adults and the rest of her cohort. There are some other really likeable characters in this novel too. The A Capella group that Jordan, as Julian, joins is full of characters, diverse characters and I really enjoyed seeing how they interacted with each other, as well as how they reacted to each other. There are other A Capella groups on campus too and they also bring interesting characters. I really liked Jordan's adviser too and I hope that that is the kind of teacher I am. The storyline is great. It is fast paced and your will definitely find yourself turning pages over and over again as you read this. There is of course a singing competition, which provides a certain level of intrigue, then there is whether Julian is going to be found out. And of course there is some relationship drama, Jordan has more than a few skeletons in her closet. There are also some scenes of real, difficult family dynamics, throughout the book, and not just involving our main character and that really grounds this book and makes it more relatable to just the average Joe who doesn't attend a fancy arts school! I loved this book, as I say I don't think that this is just for a YA audience, I think that this book would appeal to anyone with a sense of humour and a reader who wants the good guy to win for a change. This is quite a difference read from this author's previous novel and so don;'t be expecting the same thing, but do be expecting something wonderful!